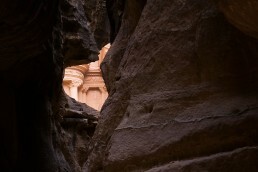 Nabatean tomb, Petra, Jordan (1st century A.D.). I had seen it many times in pictures, I had been told of its beauty, but when at the mouth of the gorge I first saw Al-Chazna (in Arabic Chaznat al-Firaun – the Treasure of the Pharaohs) in Petra, Jordan, I trembled with emotion behind my camera’s viewfinder. The two short but monumental words ME and YOU that form the title of the exhibition could also be read in the order YOU and ME, which, by changing the perspective, lends them a different meaning. Different still sounds the version US and THEM or THEM and US, making further interpretations possible. In the meantime, the exhibition’s subtitle “In search of a new solidarity” speaks of a noble effort towards civic and environmental ecumenism. Already Aristotle noted that social antagonism and contradiction is the work of those who abuse the gifts the world provides. Human nature oscillates between the opposite poles of good and evil, as was claimed by Manichaeism and is maintained by Freudianism. Brutal economics and voracious consumption turn us into numbers or objects. We find it difficult to share our material goods, but even harder to share our privileges and good fortune. Bitter historical experience tells us, however, to change the law in favour of brotherly love, to fight for the ideals of peace, justice, freedom and tolerance, to condemn racial, national and religious hatred, personal and collective selfishness and jealously guarded egalitarianism. The world’s cultures are infinitely varied, and their uniqueness constitutes humanity’s common good. Anthropological studies teach us to respect and appreciate cultures and beliefs different from our own. People of the Book – Ahl al-Kitab, as the Koran defines Jews and Christians, along with Muslims, the followers of the ancient religions of the East and the various modern beliefs should join hands in a spirit of biophilic ethics glorifying life in all its diversity and richness. Humanity is currently experiencing the drama of terrorist attacks that kill the innocent and defenceless. Millions of refugees from Asia and Africa, helpless victims of war, are flocking to Europe in search of safety and a decent standard of living. The history of mankind has seen mass migrations and the downfall of empires before. Our times bring nothing new, but we are richer for the experience of the past and equipped with new technologies. Our moral obligation is to lend a helping hand to our neighbours. But the code of the humanist warrior orders us to fight to the end, even if the goal seems merely a noble utopia. Andrzej Strumiłło (b. 1928 in Vilnius) graduated from the Painting Department of Krakow’s Academy of Fine Arts (1950); his considerable artistic achievements include paintings, drawings, book illustrations, posters, sculptures, set designs, photography and exhibition designs. His works have been presented in numerous exhibitions around the world. In the years 1982-84 he served as the director of the graphics studio at the Secretariat of the UN in New York. Over the years he has made numerous trips to Asia, putting together collections of art from the Far and Middle East for Krakow’s Ethnographic Museum and Warsaw’s Asia and Pacific Museum. He has lived in Maćkowa Ruda for many years, engaged in activities for the development of North- eastern Poland’s culture and protection of its landscape and environment.